Amanda and I saw Good Night, and Good Luck yesterday. If you didn't already know it is nominated for a bunch of Oscars, not that this means a lot, but nonetheless it is. Good Night, and Good Luck chronicles the 5 or 6 month period of time in which Edward R. Morrow and the CBS news show "See it Now" decided to take on the tactics of Joseph McCarthy during his quest to exploit American's fears of Communism in America. Morrow and his fellow producers take great risks as they put themselves in the hotseat by exposing McCarthy for being as un-American as the people he saught to destroy. Good Night, and Good Luck is almost not even a narrative film at all but is more of very artistically conceieved documentary. I guess the correct term for it is a "docudrama" but I hate terms that combine two words to make one. 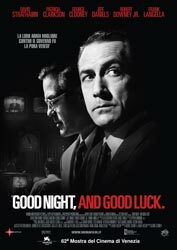 Good Night, and Good Luck doesn't require a strong emotional response from the audience like most great movies. I found myself more informed than moved, more interested than engulfed. It doesn't surprise me that it was nominated for Best Picture because by far it is the most unique picture of the year. Nor does it surprise me that David Strathairn was nominated for Best Actor because he was great. But, Good Night, and Good Luck did surprise me in that it created a new genre of movie in my opinion. I think that it should be getting even more buzz than it is simply because of the innovativeness of it. The movie combines real footage of the trials and events surrounding the McCarthy scare of the 1950s with black and white shot, smoky shadows and sternly serious men and women in the CBS rooms at the time. The 7.5 million that it cost to shoot this film surely was purely actors' paychecks and marketing because with the stock footage comprising at least a quarter of the 93 minute film and the rest of the movie being shot in the studio, it's hard to imagine that the money went into production costs. Kari and I see almost no movies in the theaters anymore. It's just so much trouble to go out. (we are taking Aidan to his first movie in a couple of weeks-- "Curious George". If it weren't for DVDs and the movies on my iPod, we'd never see any movies. GN&GL, Syriana, Capote, Crash, Enron: The Smartest Guys in the Room, Thank You for Smoking, and Junebug. They'll probably all be seen in my living room. By the way, don't you think the real footage for GN&GL cost them a bit? That may have slightly made up for the lack of other production costs. Oh yeah, and I definitely want to see "Brokeback Mountain". I read the book recently (if you can call it a book, it was so short) and was facinated. I'm really interested in seeing the movie now.